Foreigners have become net sellers of South Korean bonds for the first time in nine months, joining the selling spree on the country’s stock market and raising concerns that foreign capital could pull out of the country en masse as Korean assets lose their appeal due to subdued interest rates and weakened currency value. Foreign holdings of trading Korean debt fell in September to 112.1 trillion won ($99.3 trillion) from the previous month’s 114.3 trillion won, according to the Financial Supervisory Service on Monday. Asia was the biggest net seller at 1.1 trillion won, followed by Europe at 800 billion won. 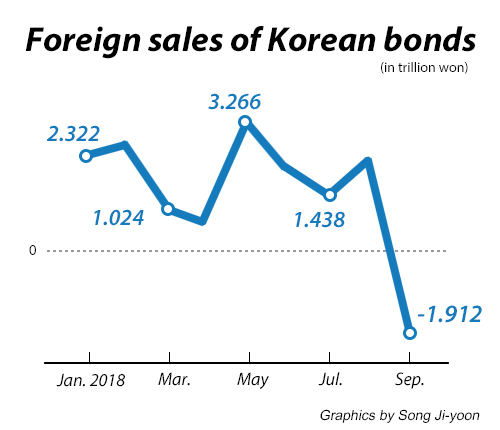 The last time foreigners turned to net sellers of Korean bonds was in December 2017 when they offloaded 1.07 trillion won. Foreign selloff has gathered pace in Korea’s stock market. Offshore investors net sold a total of 2.25 trillion won in the country’s main Kospi and junior Kosdaq markets in the first nine months of the year, according to Koscom, a Korean financial IT solutions company. Foreigners have already unloaded 2.1 trillion won of Korean equities this month alone, dumping more than 4.3 trillion won so far this year. The U.S. Federal Reserve last month raised interest rates for the third time this year to a target range of 2 percent to 2.25 percent. It alerted another hike in December, three more next year and one in 2020. Korea’s central bank has kept its benchmark rate steady at 1.50 percent since November 2017, bound by sluggish growth, subdued inflation and mounting household debt. The widening rate gap between Korea and the U.S. amid strengthening in the U.S. dollar, the escalating U.S.-China trade war and rising oil prices have stoked concerns that emerging market woes from the foreign capital exodus could spill over to Korea. The Bank of Korea holds a monetary policy meeting on Thursday. Some analysts have warned that the flight of foreign capital could accelerate with the weakening of the Korean won, as more foreign investors choose to sell off Korean securities to mitigate currency risks. The Korean won last week plunged to a one-year low against the U.S. dollar.